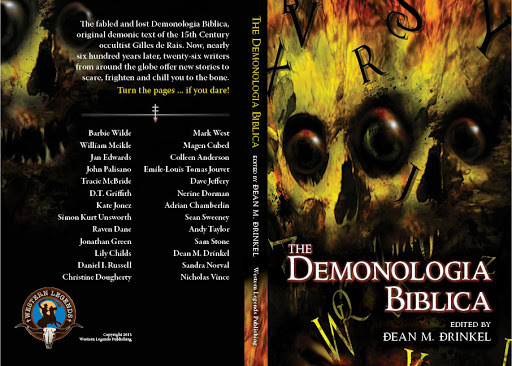 So I’ve been involved in this really cool project for the past four or so motion-blurred months: The Demonologia Biblica. A horror anthology from Western Legends Publishing featuring twenty-six stories by twenty-six authors about demons of all kinds doing all sorts of crazy evil things that only demons could do. I was tasked to write a story featuring a demon with a name beginning with the letter F. After more research I care to admit to on some really geeky strange sites, I found my options were small. Like five options small, three of which were different spellings of the same guy. So I picked Furcas, a knight of hell who is known for teaching and wisdom and whatever else the old books purportedly claim according to those people who study this stuff. His simple folkloric appearance suggests that he is a harbinger of death, but he is also a calm rationale sort of guy. Who knew demons could be pleasant or nice? My story, “Lies Under Skin,” tells the tale of a seemingly good guy’s encounter with Furcas on the road. Set in the autumnal wooded Hudson River Valley just north of New York City, it gives a subtle nod to one of the area’s most well-known historic writers, Washington Irving. His work was one of my early influences that shaped my taste for fiction. If any of you are wondering, I might have had something to do with the cover design, that seems to happen a lot. The incredible illustration credit, however, goes to the talented artist James R. Powell. I will post more here when the book becomes available for purchase, should be by start of February. This entry was posted in anthology, dark fiction, fiction, horror, short fiction, Western Legends Publishing, Writing and tagged anthology, dark fiction, fiction, horror, short fiction. Bookmark the permalink.